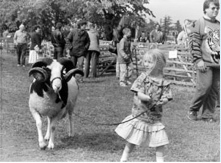 I think Jacobs are some of the prettiest sheep around and was hooked on them from the moment I was given my first ones for Christmas in 1982. There are two distinct types, and the popularity of each seems to be confined to different areas of the UK. For instance, the four horned Jacobs are more common in the northern and western parts and the two horned type is found more in the central and southern areas. This results in two horned animals being brought south for better sale prices and four horned ones travelling north. Some people keep mixed flocks but many folks strongly prefer one type or the other….leading to a gentle rivalry between flock owners! However, both types inspire a great affection amongst their keepers and give daily interest and pleasure. 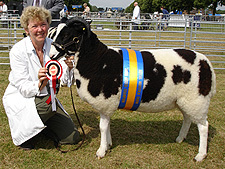 This website is not just a showcase for the Woolpit Jacob flock, but also full of useful information about the breed, from showing tips to selecting a sheep and general advice on animal husbandry. Over the years, I have chosen to keep some of the best natured sheep - so you could say that I have, now, a fairly "laid back" flock. 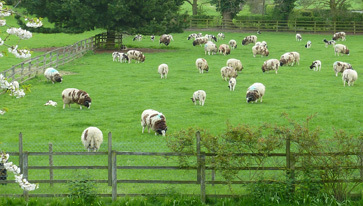 Several Feb/March born ewe lambs available this year. All vaccinated and wormed. 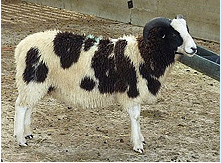 We also have several rams for sale.